Our kitchen is definitely a working kitchen. I cook at least five nights a week and we entertain at least once a week. I have a very crazy schedule and obviously, don’t focus on the inside of my cabinets as much as I should. So don’t be shocked by what you see. 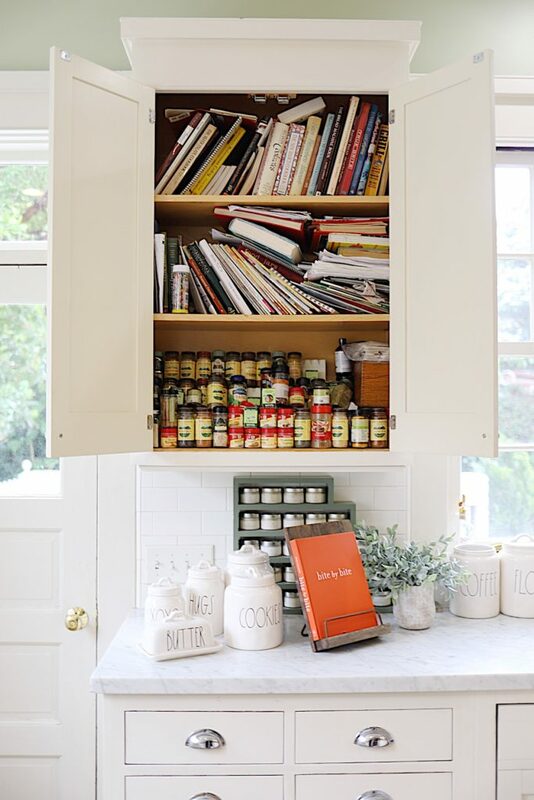 For example, look at this nice and relaxing photo above of my spice and cookbook cabinet. It’s soothing and a perfect photo for Instagram or Pinterest. But let’s look at what it looked like on the inside. Now, do you see that real life happens to all of us? Look at how my spice and cookbook cupboard looks now. Can you believe the difference? It makes me so happy! 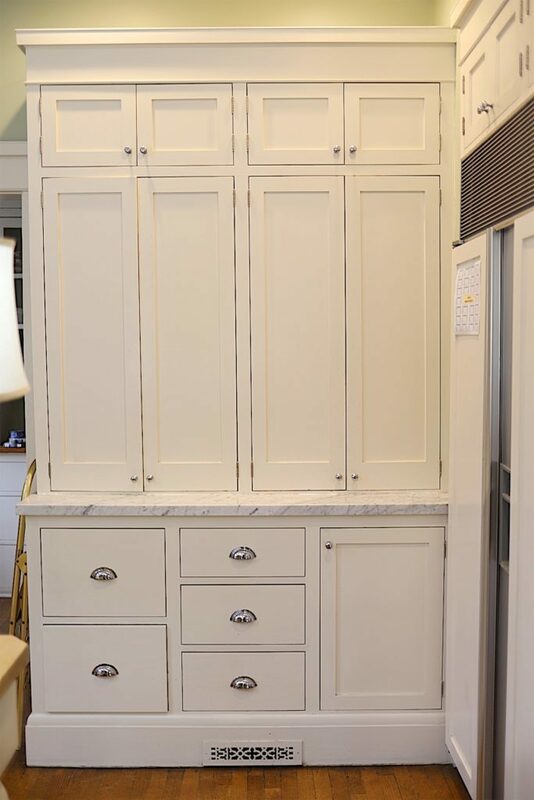 Perhaps it is time to take Instagram photos with my cupboard doors open! To organize my spices, I used two Double Turntables (stainless steel). I probably should admit that while I was organizing this cabinet, I found some spices that had expired. 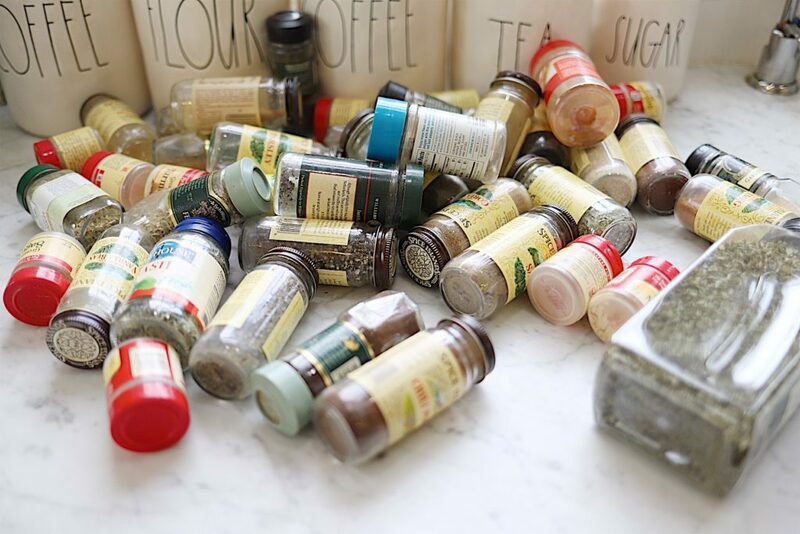 Or perhaps I should say I found A LOT of expired spices (as you can see in the photo below). Fortunately, it’s not like a spice with an expiration date of January 2010 will make you sick. Instead, it probably tastes bad and will no longer “spice” up a meal. A quick tip I learned is that if there is not an expiration date on the spice bottle (and just a code), then it is highly likely the spice is expired. The spice companies used codes a very long time ago and now most of them print the expiration date on the bottle. I also think The Container Store products are the best. As I was adding new bins to my refrigerator, I noticed the heavy quality of the plastic compared to the ones I have used before. Another thing that made me happy today was the fact that every single label on the containers I used came off easily. You know how irritating it is when you can’t peel off a label and it leaves that sticky residue? That did not happen once! 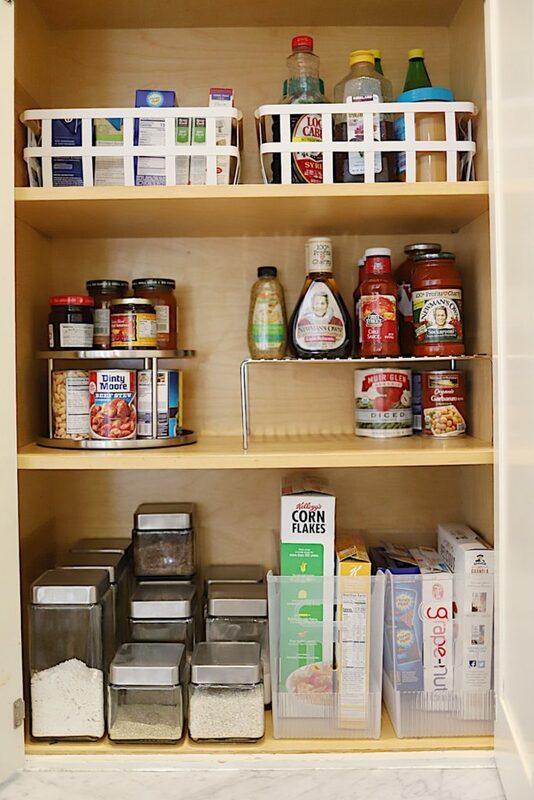 When I shopped on The Container Store website for the items to organize my kitchen, I used the reference photos to help me make decisions. At first, I was a bit overwhelmed with all of the choices. But using the photos really helped me make final decisions on the products to use. My plan to organize my kitchen was all about fashion AND function. My girlfriend and I joke that fashion is always more important than function. But when you are organizing your kitchen you need to do it so that it works for your family and so it will last. As much as I would have loved to have every container perfectly matched and all my food to be in the same color palette, I knew that wasn’t realistic. I needed to think about what food might be in our refrigerator next month. I always need room in our refrigerator for an extra milk carton. Or for the times I buy a lot of food when we are entertaining. 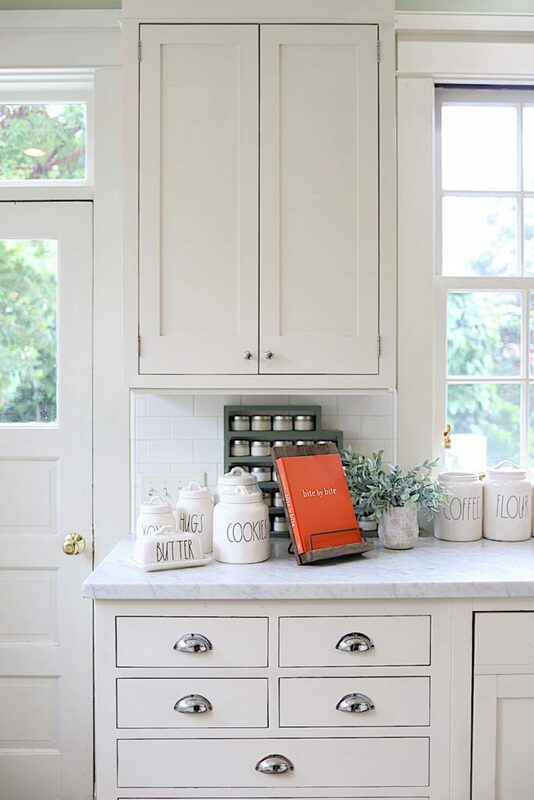 When you organize your kitchen remember to be practical and come up with a system that works for you. Below is a photo of what is what it looked like on the inside. Oh my. 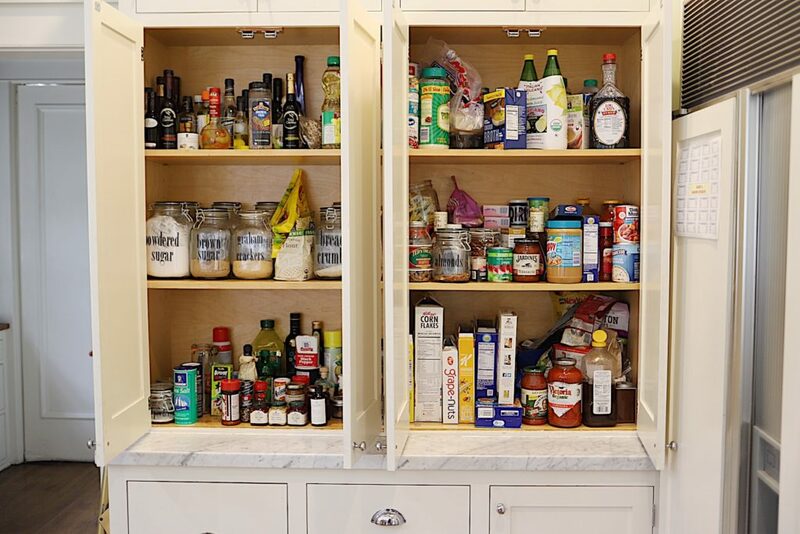 In case you are wondering how I organized this pantry, the first step was to completely empty out the cupboard. Next, I discarded anything that had expired and then cleaned the shelves. The final step was to organize the items by category. I cannot believe what a difference this makes! Adding shelves almost doubled my space. I emptied all of the bags of rice and put them in the glass and metal containers. Who knew that I had four already opened bags of arborio rice? I love risotto but really? Ugh. I love the white Tosca Basket w/Wooden Handles that I put on the top shelf. 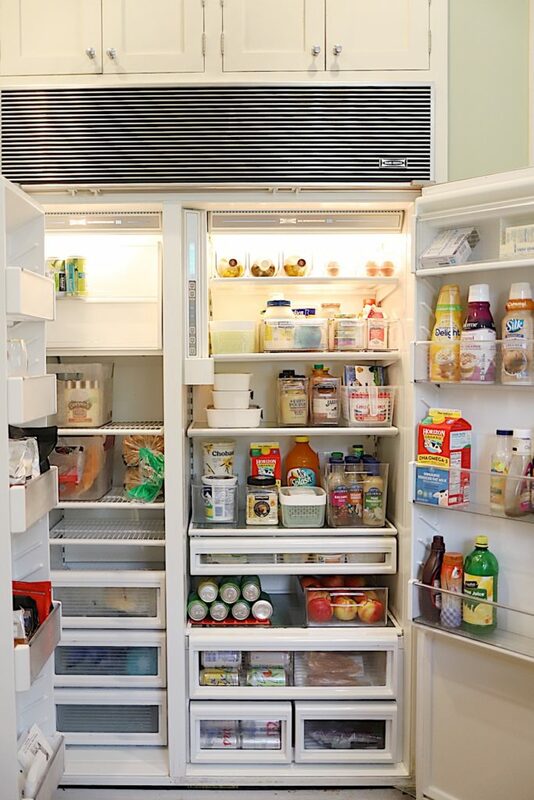 They make it so much easier to pull down to see what’s on the top shelf! The Double Turntables and Cupboard Shelf are fabulous too. This is how the left side of the cabinets look now. I moved the glass canisters to the top shelf because they are so easy to identify. Previously I had no idea I had so many flavored oils and kinds of vinegar. So I moved them down a shelf and put them in containers that I can easily take out of the pantry to make a selection. I stored the cereal boxes in a Large Multi-Purpose Bin. I absolutely love that these are now organized. I needed more containers to store rice, nuts, rice and more. I used the 1.5 qt. Glass Cannister Aluminum Lid, 1 qt. Glass Cannister Aluminum Lid, and the 2 qt. Glass Cannister Aluminum Lid. Next, I re-arranged a few of my drawers. 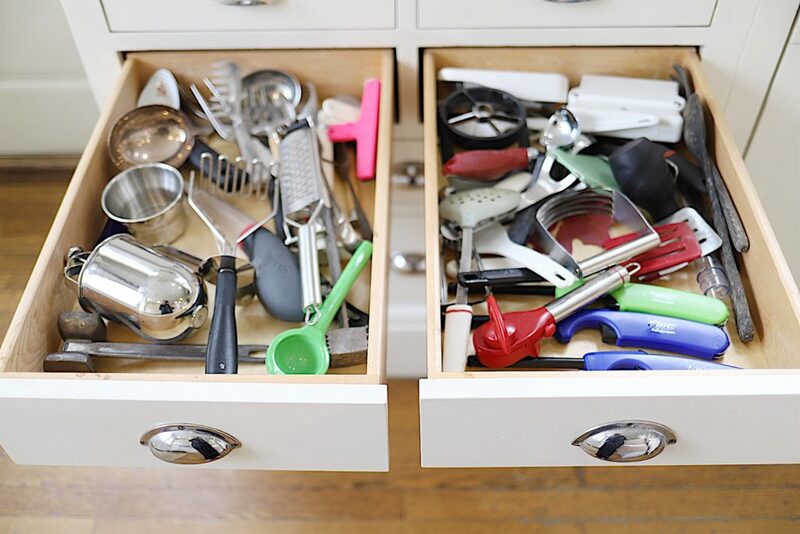 As you can see, everything was in total disarray in my utensil drawers. 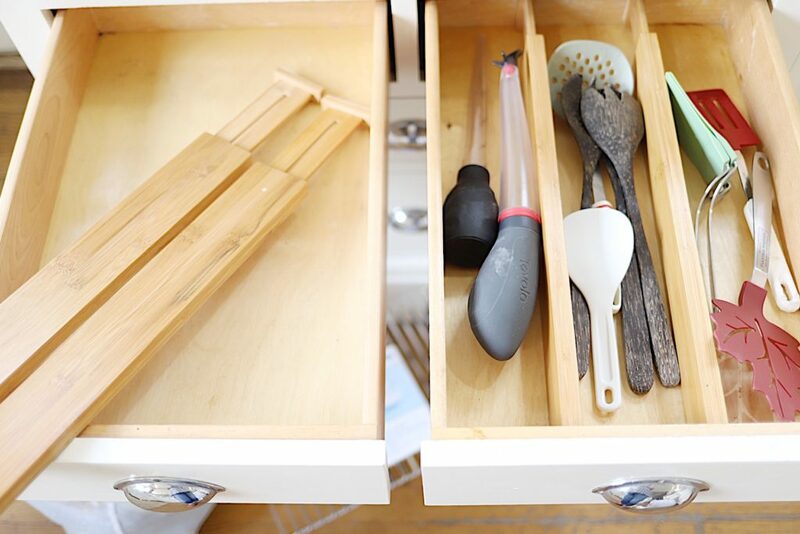 I found these adjustable Bamboo Drawer Dividers that match my cabinets perfectly. They come two in a package and they are great. And I love the end result. 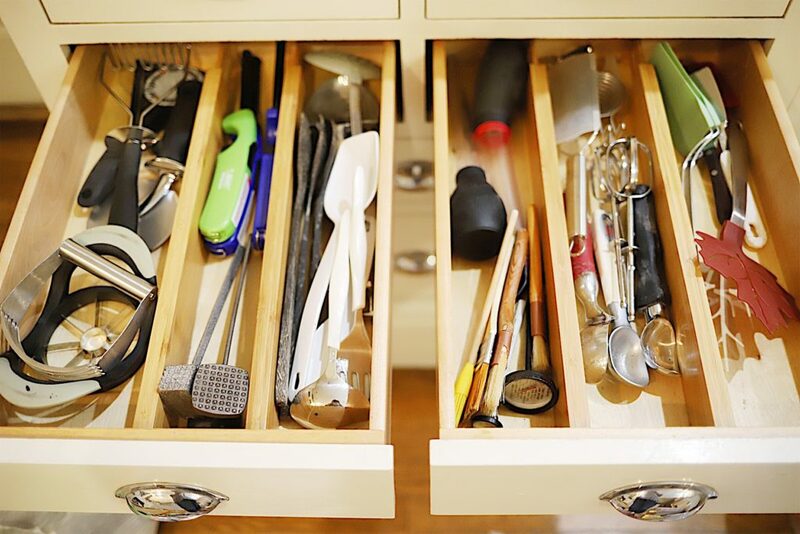 All of the utensils are sorted and much more organized. I learned a very important thing about organizing my kitchen today. Clutter is expensive. When you can’t see something you don’t think you have it. So you buy it. Again and again. 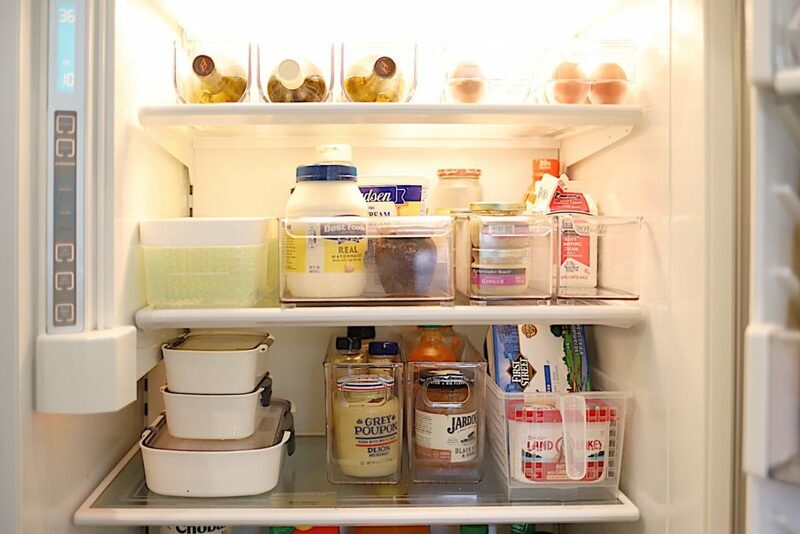 When I emptied out my refrigerator I found six bottles of my favorite Caesar salad dressing. And four jars of fig jam. And six large packets (from Costco) of butter. In my pantry, I found seven cans of evaporated milk. And six cans of condensed sweetened milk. These are items that I only need for one recipe. And yet, I kept buying them over and over because I didn’t think I had them! And the worst part is that they were all expired. So making an investment to get your kitchen organized will save you some money. 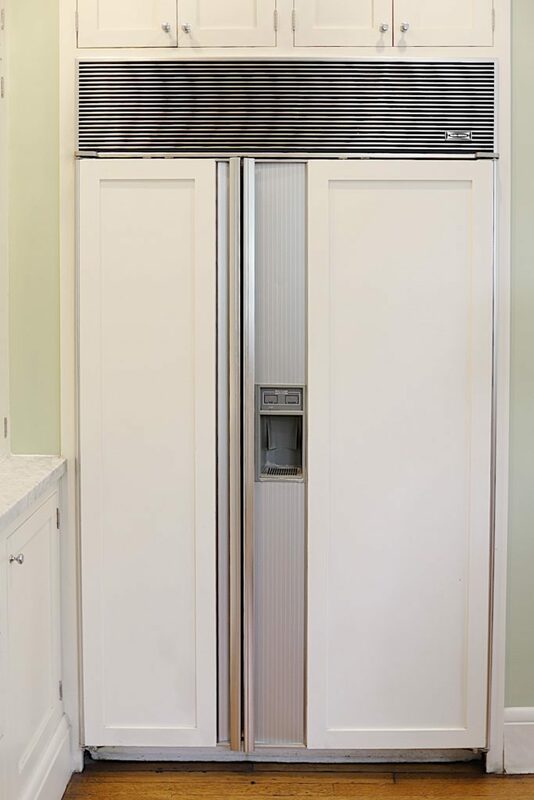 Next, I tackled our refrigerator and freezer. There were a few things organized but basically, it was a disaster. 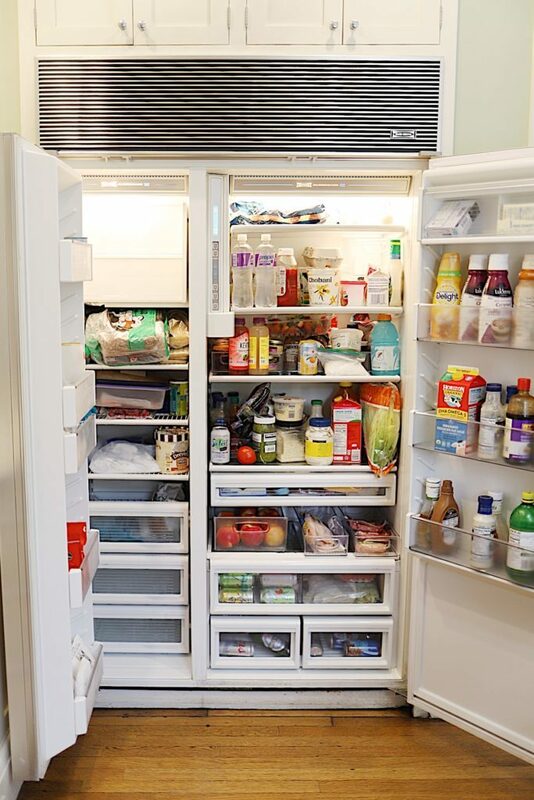 Part of the disorganized state of the refrigerator is that we just fed twenty-five college volleyball players on Friday and we had a lot of extra food leftover. But with a little bit of organization, it made a huge difference. Once again, I categorized the food and put it in bins. For the first time, I have two Fridge Binz Egg Holders for fresh eggs AND hard boiled eggs. (I love hard-boiled eggs by the way.) And the Fridge Binz Wine Holders are such a great idea. I also left room for more food and moved the shelf heights to accommodate taller items that never seem to fit. I love the containers I bought for fresh vegetables and fruits. They are the 1.6 qt. Green saver Produce Keeper, the ProKeeper Deli Container, and the ProKeeper Mini Deli Container. I am so tired of having to throw away strawberries a day after I buy them. By taking them out of their original container and properly storing them, they will last much longer. I used the Small Handled Storage Basket to hold our butter. The gazillion bottles of salad dressing are in a Wide Deep Fridge Binz Tray. 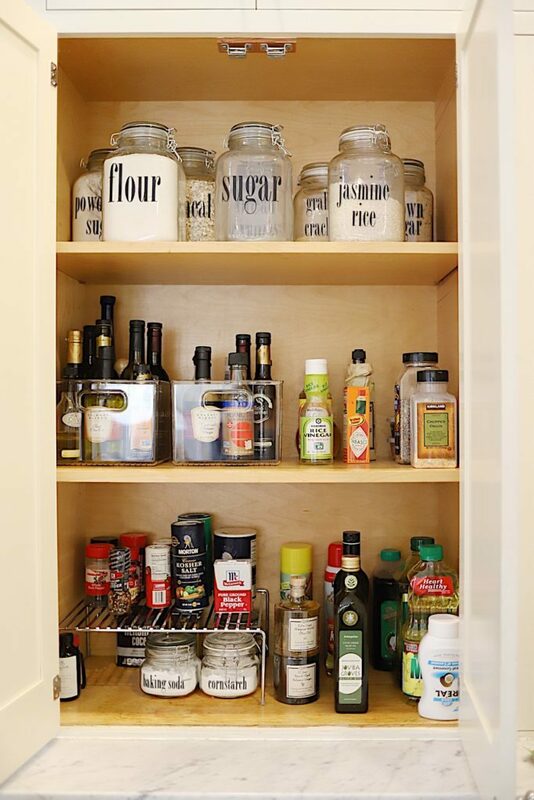 The other items are stored in a Linus Large Pantry Binz, and a Linus Rectangle Pantry Binz Clear. In the freezer, I used Large Divided Freezer Bins. And the red Fridge Monkey supports our canned beverages perfectly. I used a Cupboard Shelf to provide more space in the cabinet. We have a second sink in our kitchen. It’s hard to photograph because it is behind the island. 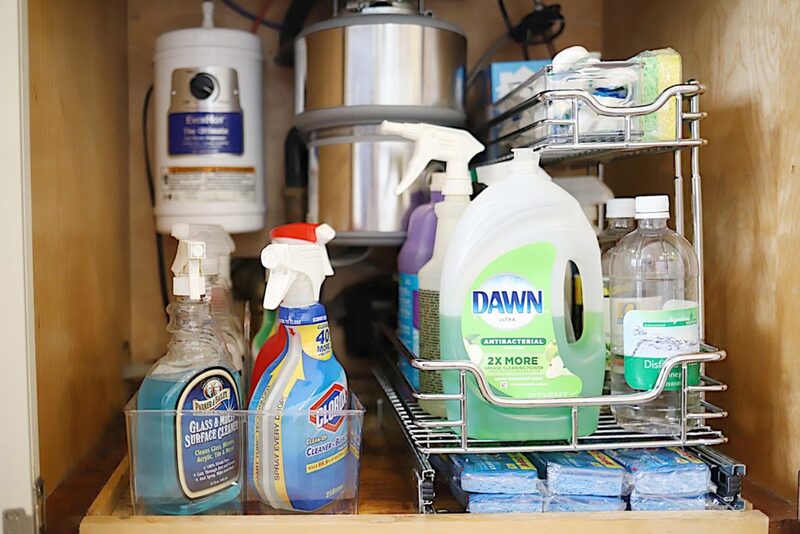 I love the 2-Tier Sliding Organizer that holds so many items under the sink, I ordered two of these but the other one didn’t fit under the sink because the plumbing was in the way. Be sure to measure if you get one of these. 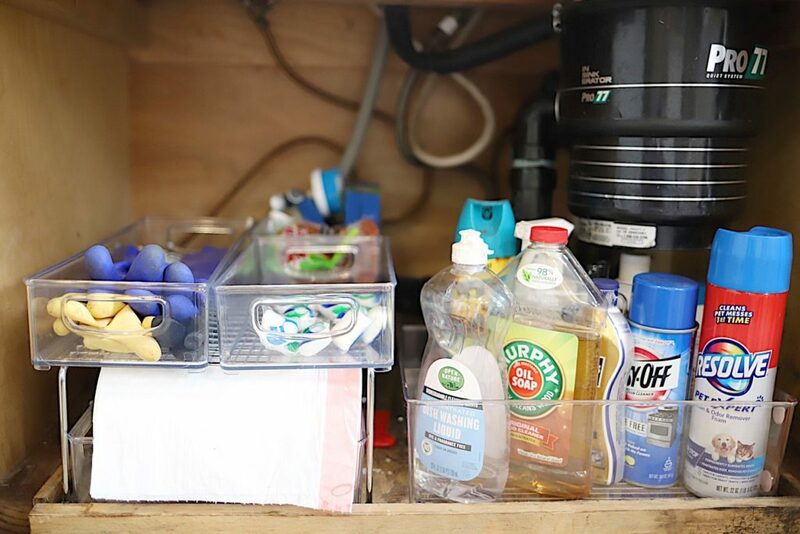 I put all of our cleaning products in a Linus Large Tote Caddy. 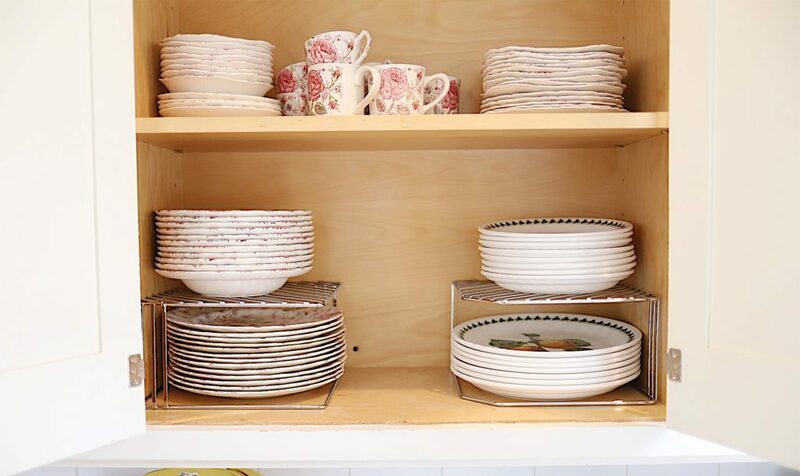 I added the Single Corner Shelf in our upper cabinets to make more room for my vast collection of plates and glasses. This is so much better than stacking them on top of one another. The Container Store also has great decor items and cooking utensils. I got a 1.5 gal. Beverage Dispenser w/Spigot and a 34 oz. Giara Water Bottle to help store more water in the kitchen. 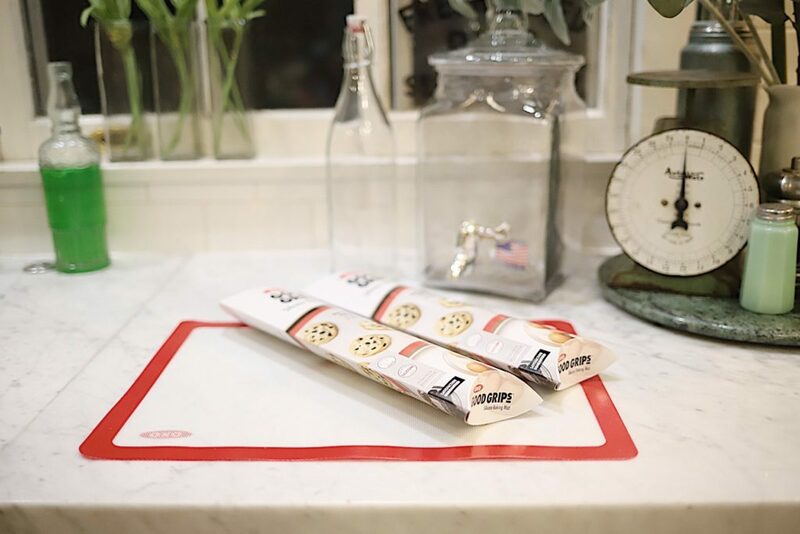 I also ordered OXO Good Grips Silicone Baking Mats because I love these and needed more! This blog post has been all about “real life” and I thought I would end with a photo of what my kitchen looked like when I started this project. I hope you have enjoyed this as much as I have. 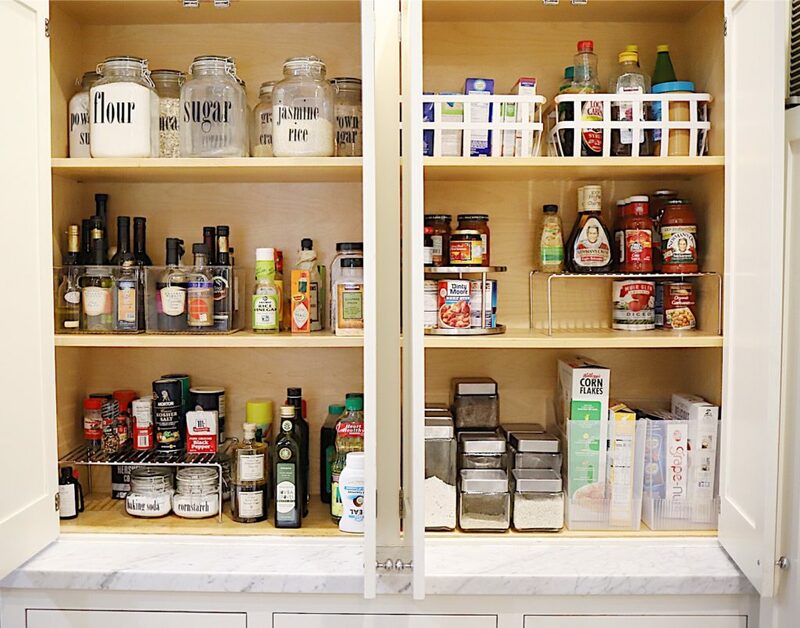 Organizing your kitchen is a big project. But it is so worth it! 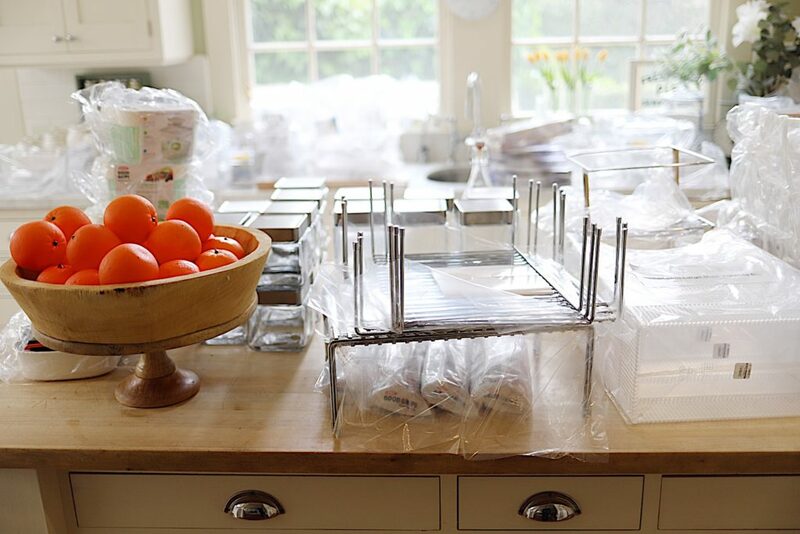 Don’t forget The Container Store’s Annual Kitchen Sale is going on now through April 7th! 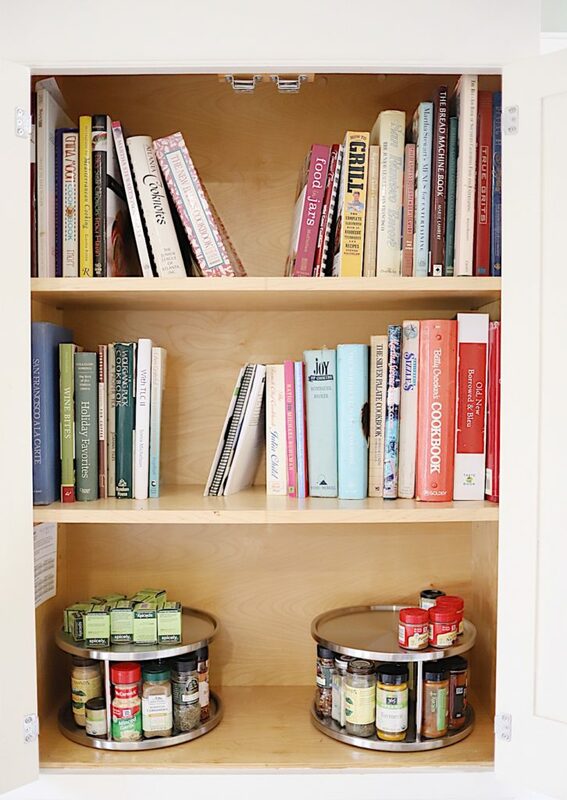 If you want to start with a smaller project in your kitchen, start with the areas you use the most. 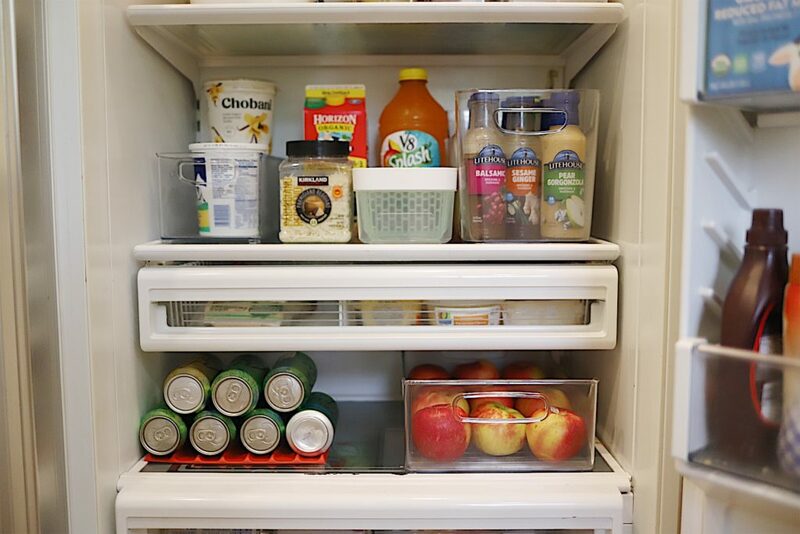 This is likely your refrigerator and pantry or snack cabinet. 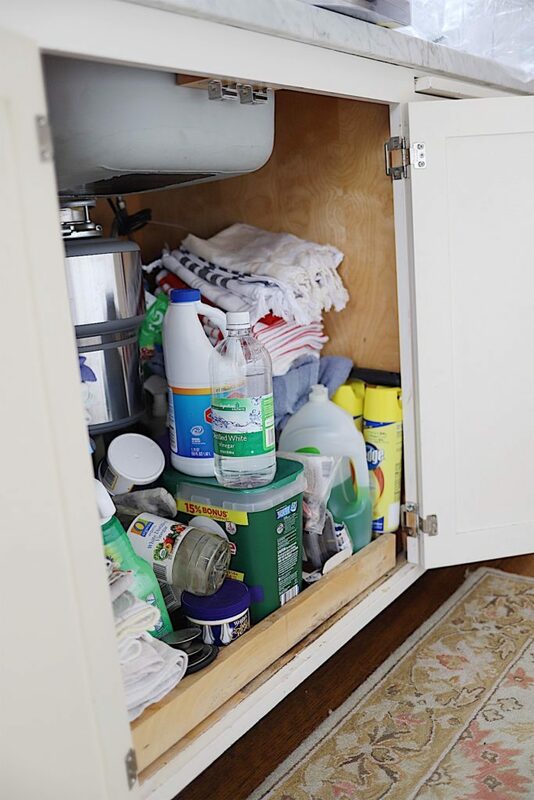 This way you will appreciate the organization every day and you will be able to shop smarter when you can see what is in your cabinets. Have fun! This project has been wonderful. I love this Leslie! I’m going to the Container Store just so I can pull the stickers off without the mess! Wine holder in the fridge – brilliant! I got lots of great ideas and am now all inspired to do some more organizing. 🙂 Thanks for the excellent article! Oh, that’s wonderful Barbara! I hope you can catch the sale. And yes, I am so tired of trying to fit wine bottles in the door of my fridge! I love the holders. Wow! 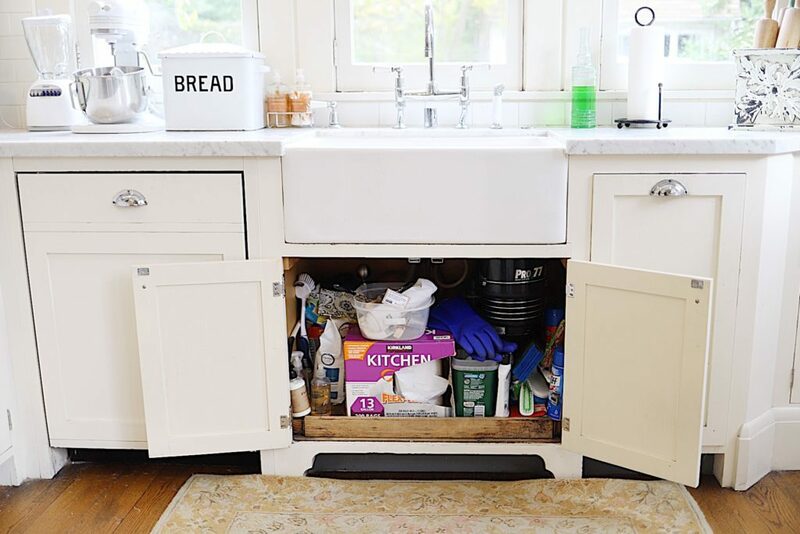 I would have never imagined that your kitchen had organizational issues….Thank you for keeping things real and sharing the imperfections. I think many of us strive to keep up with the beautiful images that we see on Instagram, but end up feeling defeated at times. 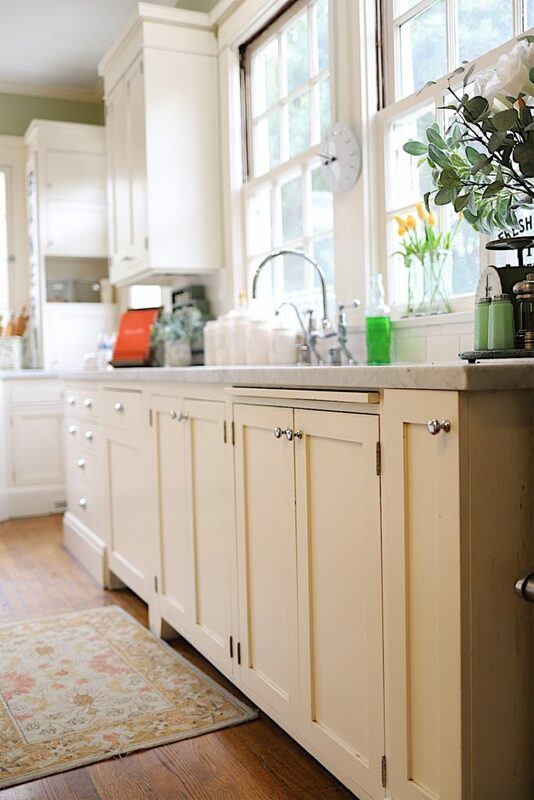 Your before and after photos certain help with the “how-to” accomplish the transformation to a more organized and functional kitchen. Thank you again! Thanks Nikki! I don’t ever want anyone to feel defeated. That’s why I try to share my life as it is! You’ve inspired me, Leslie. Thank you! Thanks Wendy! I am a bit embarrassed that I waited so long to tackle these cupboards. I hope everyone realizes I am human. Ugh! Thank you! I had so much fun writing this blog post. Although it just might be the longest one ever! Oops! I do love those drawer dividers! I feel so normal now. I could not believe you had these issues. It’s a constant struggle to keep a working kitchen organized. You’ve inspired me. Thank you. Thanks Lucy. I am just a normal gal who is trying to get caught up with everything. I just wish I wasn’t so busy all of the time! I love your kitchen in all it’s real, lived in glory!!! The Container Store is my favorite place for all things organizing, too! We don’t have one nearby, so I shop online. Don’t the bamboo dividers make your drawers feel custom? I love mine. Also, have you seen their “stasher” bags…kind of a silicone zip-lock bag?! I plan to get those during the sale! You’ve inspired me to do my freezer! Thanks Leslie! Thanks for sharing your organizing tips. You have done a great job. Here’s a couple of additional tips for you. The boxes of cereal for example – put your cereal in plastic or glass containers and save even more space. Another tip for you, use a small binder clip and a command hook to hang your kitchen gloves under the sink.